ATLANTA, GA--(Marketwired - Mar 23, 2015) - When John O'Shaughnessy was covering KISS songs in a high school garage band, he never dreamed that one day he would be standing next to Paul Stanley, the band's guitarist and frontman, at the bedside of a child following microtia surgery. But that's exactly where the Founder and CEO of Matrix Surgical USA ended up a few weeks ago as a surgeon used his company's implants to reconstruct ears for two children with microtia. Microtia is a congenital deformity that occurs in approximately one in 10,000 births, with the child born without outer ears and even ear canals, causing significant hearing loss. Stanley is one of the better-known people to suffer from microtia. The KISS rock star says he knows the loneliness of growing up with microtia and hopes to inspire young patients with his story. Stanley says he was teased and bullied as a kid. Stanley is a supporter of Mending Kids, a California-based not-for-profit organization that raises money and support for these microtia operations as well as other life-changing surgical care for children worldwide. Over the years, thousands of children have received corrective, transformational surgeries from Mending Kids, giving them a chance at longer, healthier and happier lives. Traditional microtia surgery is usually limited to children eight years and older and can take up to half-a-dozen operations to correct the condition. However, doctors in Los Angeles have developed a new technique that can be used on younger patients and requires a single surgery. The surgeons used Matrix Surgical USA's OmniPore® product, a porous high-density polyethylene surgical implant that allows the patient's tissue to grow into the material. Matrix Surgical USA is a leader in the development, manufacturing and commercialization of craniomaxillofacial implants. It is one of only two companies in the world to have a 510(k) clearance, CE Mark (EU) and regulatory clearances in numerous other countries for both off-the-shelf and patient-specific high-density polyethylene craniofacial implants. "It was truly a remarkable experience," said O'Shaughnessy of the surgeries. "The children receiving the operations were close in age to my children, so that really affected me. And then to be able to meet Paul Stanley, an icon in rock music, was terrific. He was so encouraging with the children and nice to everyone participating in the surgeries. "This was the first time we've supported Mending Kids, and we look forward to a long and ongoing partnership to help children desperately in need of these procedures," O'Shaughnessy added. It has been an eventful few months for Matrix Surgical USA. The company recently moved into its new headquarters, which includes a class 10,000 (ISO7) clean room for manufacture of its implants. Additionally, the company was recently recognized by Georgia's Governor Gov. Nathan Deal with a GLOBE (Georgia Launching Opportunities By Exporting) Award for entering one or more new international markets in 2014. Matrix Surgical USA is a privately owned American company dedicated to the design, production, marketing and distribution of sterile, biocompatible craniofacial implants. Matrix Surgical USA offers its products to healthcare providers in the United States and in more than 60 countries around the world. Learn more at www.MatrixSurgicalUSA.com. 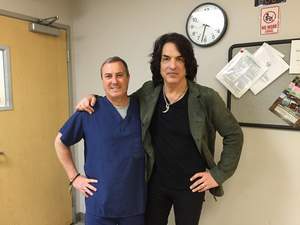 John O'Shaughnessy, Founder and CEO of Matrix Surgical USA (left), with Paul Stanley, KISS guitarist and frontman.